Don't sweat it, I've found the perfect gift for you! I have put together some holiday gift certificates for anyone interested in purchasing a ride for friends, family, moms, daughters, dads, brothers, colleagues, you name it! Gift certificates are available in any increment. Please contact me directly for more information, thanks! Preparing for the cold weather! Water buckets have ice around the edges. 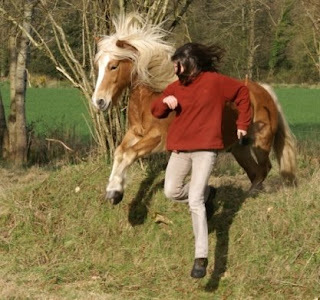 Horses are big and furry instead of smooth and silky. It's time for longjohns and hotties! I have purchased (though some advice from a student - Thanks Bev!) a great big pack of "Hotties" from Costco. If you haven't heard of Hotties, they make hand warmers and adhesive foot warmers for cold weather. The adhesive foot warmers work great for riding and being in the barn when you stick them right to your sock inside your boots. The hand warmers keep fingers warm, and usually you can get by with just one if you remember to switch them back and forth from hand to hand. If you are interested in trying them, I will have them available for students for $2.00 each (to cover my costs). Also, several places in London sell thermal underwear and cold weather gear. I have found great success in buying mine from Mountain Equipment Co-op (thanks to another student who does winter hiking and camping for this referral!). The store is located in Toronto, but you can order items online and I believe shipping is free until December 4th. The thermal underwear, tops and bottoms are FANTASTIC. I don't know how I lived without them. When I was at the store, I was lucky enough to meet a sales representative who rides horses and knew exactly what I needed. I use the Polartec medium-heavy weight thermals. They have stood up to wear and tear for me and kept me warm when I'm standing in the arena in the middle of winter. I also purchased boot liners and glove liners which make a huge difference. This year I bought a helmet liner. I would recommend for most students to buy a helmet cover (available at Greenhawk). They are warmer and cover the helmet as well as your ears and cheeks. The liner I chose because when I ride I often ride hard enough that I sweat. The liner has a moisture wicking fabric over the skull, and warm fleecey patches for my ears. The website is www.mec.ca if you are interested in exploring these suggestions further. Hope you find these helpful, and please remember the barn is always colder than you think it's going to be so DRESS WARMLY, riding isn't much fun when your fingers are frozen and you can't feel your feet. I believe that experience with both disciplines will prove beneficial to any rider. Having experience with both disciplines I will say that I very much enjoy both, but choose to teach and ride mostly western. The reason for this being quite simple. The western tack, training philosophies, and breeding in western horses make for, in my opinion, a safer bet for students (and myself). The tack provides more support for the rider should they become unbalanced. The training emphasizes stopping, backing and slowing on command more so than most english trainers. The most common breed for western riding is the Quarter Horse, known for it's levelheadedness. That being said, I do teach many dressage principles to my western students, and encourage them to ride in an english saddle to gain a more thorough understanding of the feel of the horse: something they can not develop as easily through the thick, heavy western saddle. I disagree quite strongly with any coach or trainer who says "An english rider will have no problem switching to western, whereas a western rider will struggle to learn english". In my experience as a coach, and after observing countless fellow students at Meredith Manor International Equestrian Centre attempt "the switcheroo", I find an excellent rider is still an excellent rider, and a poor rider is still a poor rider, no matter the discipline. Watch any english rider switch to western and you will see communication errors, watch any western rider switch to english and you will see communication errors. I encourage riders to experiment with both and not to become part of the rivalry that goes on between english and western riders. In most cases, if someone feels so strongly about one being far superior to the other, it is due to a lack of knowledge of the sport. The article below explains some of the differences and the Video -------->CLICK HERE<--------- is a fun watch. Enjoy! It’s more than just a costume…I’ve been to many horse shows over the years, and frequently show in both English as well as western classes. Occasionally even with the same horse. However, I strongly feel that it’s important that exhibitors understand and better determine how to show their horse to his best advantage. A horse’s way-of-going, as well as the rider’s participation is significantly different from English Pleasure to Western Pleasure riding. Granted there are many similarities in the two disciplines: a correct and willing cooperation of horse and rider being the overall goal. While many people are sincere advocates of one discipline or the other, they both have their challenges as well as accomplishments and I would never try to say one method is more accomplished than the other. Western riding hales its history from the cowboy using his horse for ranch and range work. Western saddles need to carry not just the ranch hand, but his rope, rifle, bedroll, canteen, and anything else he may need for the entire day in the elements. Of necessity it evolved to be heavier and larger framed to spread the weight over a greater portion of the horse’s back as well as have larger fenders to protect the horse from friction of the various accoutrements hanging from the saddle. This heavier, bulkier saddle and fenders reduce the close contact feel of the rider’s legs and seat; and often necessitates the use of spurs to enforce the limited heel contact available. So what we end up with is a horse that must respond quickly to the one-handed neck rein, usually well before bit contact is achieved; as well as the slightest shift in the riders weight to anticipate a necessary change of direction. A horse whose head needs to be carried lower to better focus on hoof placement and trail obstacles: a working horse who knows its job of supporting the rider’s in his working environment. Modern English disciplines, in my opinion, have evolved more from pleasure and sport riding in these later centuries, than from the aspect of a working horse. It has mostly focused on two objectives: to enhance the communication and harmony between horse and rider, and for performance riding in the show ring and racing circuits. The saddles and tack are lighter and less bulky. The rider strives to achieve and maintain communication through his/her seat and legs as well as light bit contact; to facilitate a synchronized effort between them and their horse. The horse willingly responds to these aids with greater collection, balance and lightness in his gaits and overall performance. His entire demeanor is geared more for performance than work, more focused on the rider and less toward possible obstacles underfoot. So when we choose to show our horses we must evaluate which of these disciplines will showcase his talents the best. Does our horse work well on a loose rein, with minimal leg contact, a more relaxed and natural head carriage and does he respond quickly to little or no bit contact? He will most likely be judged better as a Western Pleasure horse. Does our horse carry himself with light collection, willingly engaging in light bit contact, and work well with us responding to our subtle seat and leg aids? Does he carry his head in a more elevated "look at me" demeanor while flowing forward in a natural impulsion? Then he will most likely show well in English Pleasure divisions. You may have a horse that will do both, but please understand that to simply put western tack on a horse that needs active bit contact in order to maintain his carriage and balance or to gait correctly, defeats the objectives of the Western Pleasure horse. Or conversely, to put English tack on a horse that will not engage the bit and insists on a more relaxed head carriage undermines the performance objectives of English Pleasure riding. The demeanor and carriage of the horse, as well as the active participation of the rider are far greater influences of which disciplines a horse can, and should, show in. While most horses can be trained to make adjustments for both disciplines, exhibitors must realize that each horse will probably tie better in one division over the other depending on that horse’s strengths. Another great video for you to watch with friends and family!